Is Carl Jung having an American Renaissance? That’s the question asked by Saybrook Psychology Professor Eugene Taylor, who has recently been asked to review two books about Jung’s work for the APA’s website. 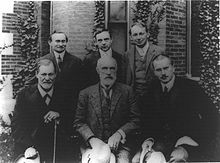 A recent upswing in positive reviews of Jung’s work, new analysis about Jung’s insights, and popular acclaim, Taylor suggests, are signs that even academic psychology – long dominated by “experimentalists” who didn’t believe anything they couldn’t measure under laboratory conditions – is accepting the value of depth psychology’s approach to the human mind.